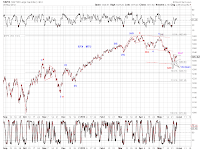 The market has so far stayed within a two-week range (Chart 1, blue). 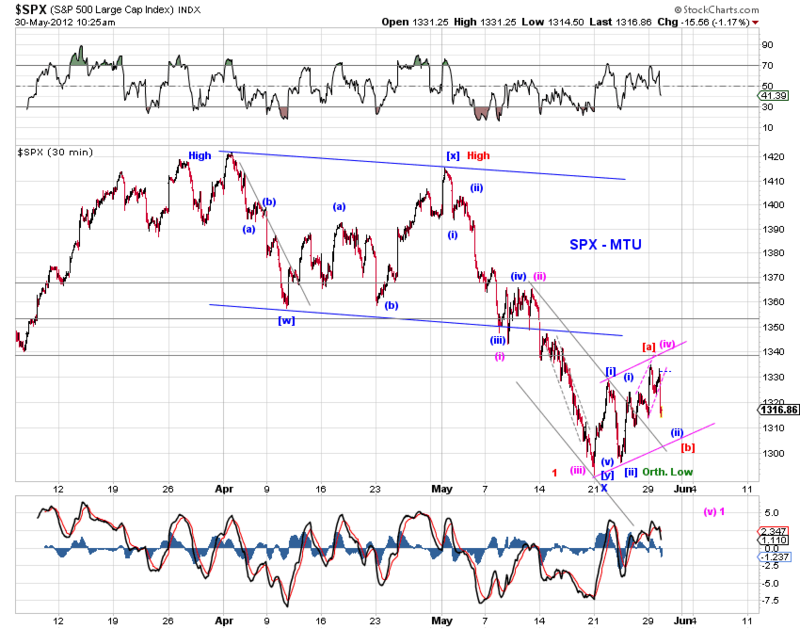 But note that the bullish blue count is suggesting a powerful upward swing. 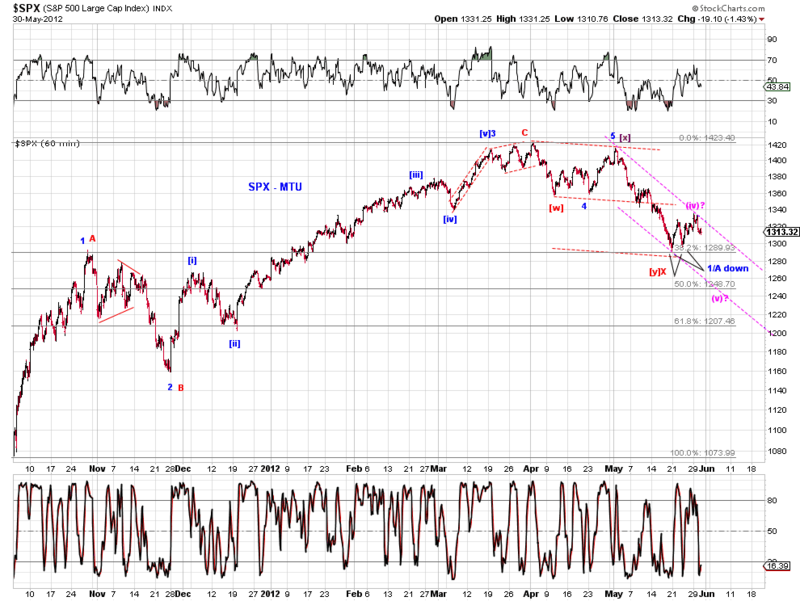 The bearish counts show a small-degree 2nd wave of a regular [v]-down (purple) or an EDT [v]-down (red) is in progress. 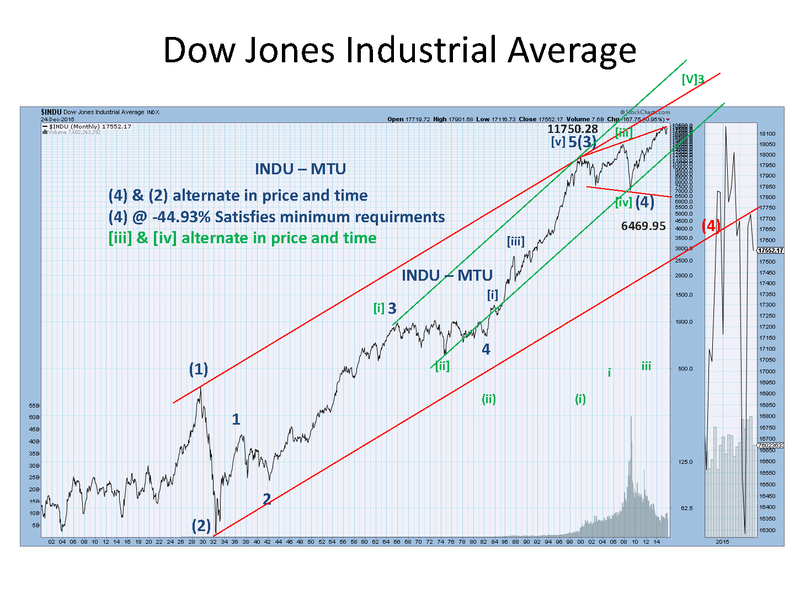 Chart 2 shows how these tracking counts fit into the big picture. 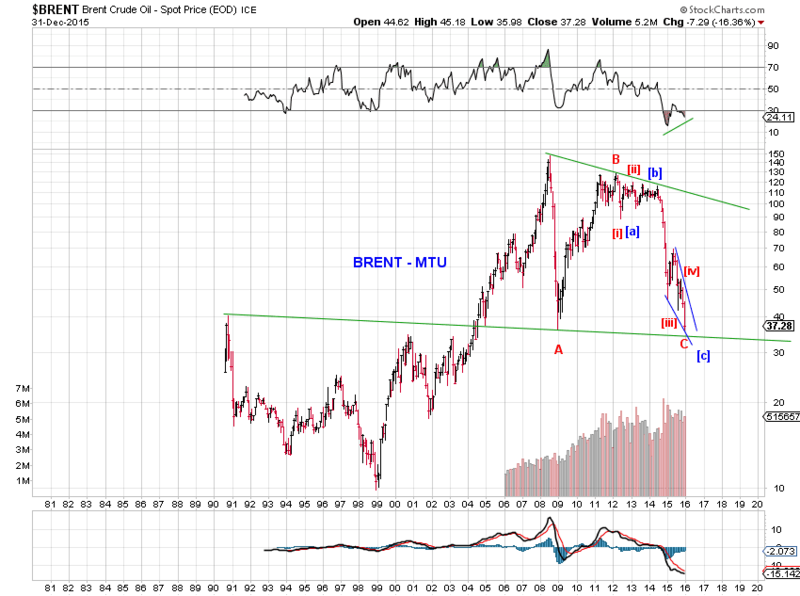 Large-caps are weak. Mid-caps and small-caps are holding up much better. See chart for color-coded tracking squiggles. It's a month-end date today. ES bullish count (blue) - -up off the May low as an LD. 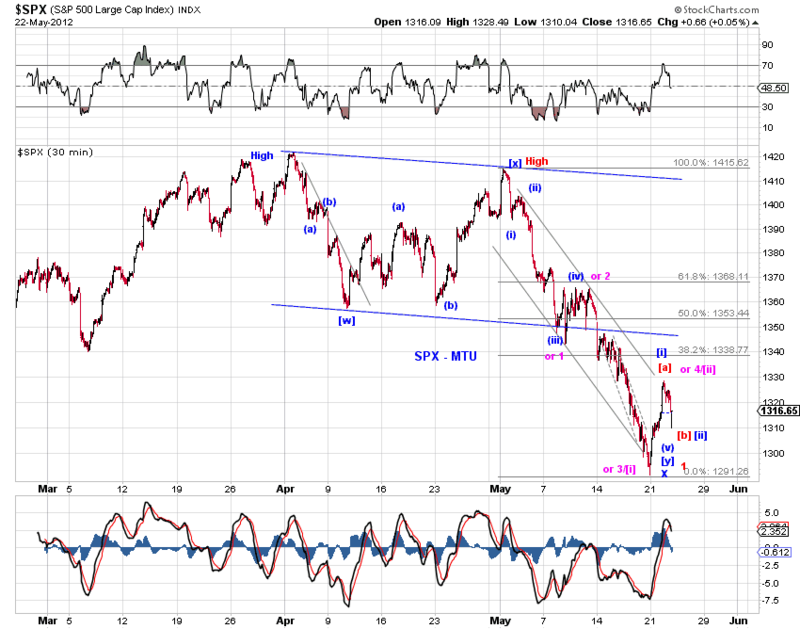 -down found overnight support at 0.618-fib retrace. 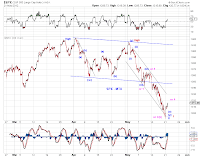 We could see one more downswing for -down but it is not required due to (1) a potentially completed zigzag decline OR (2) a potential double-three rebound count (not shown). 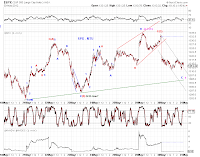 ES bearish count (red) - (A)(B)(C) rebound to the recent nominal high. 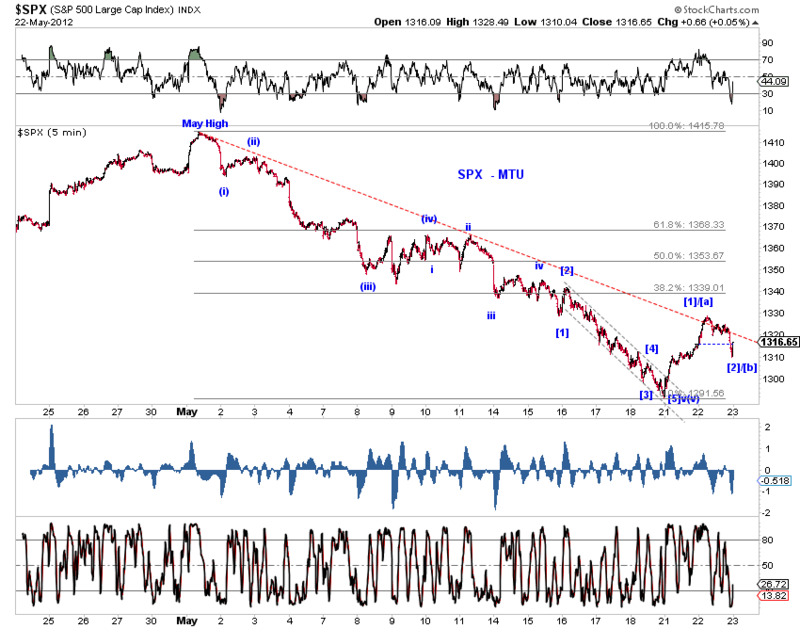 (1)-down is complete at the overnight low, (2)-up is in progress. 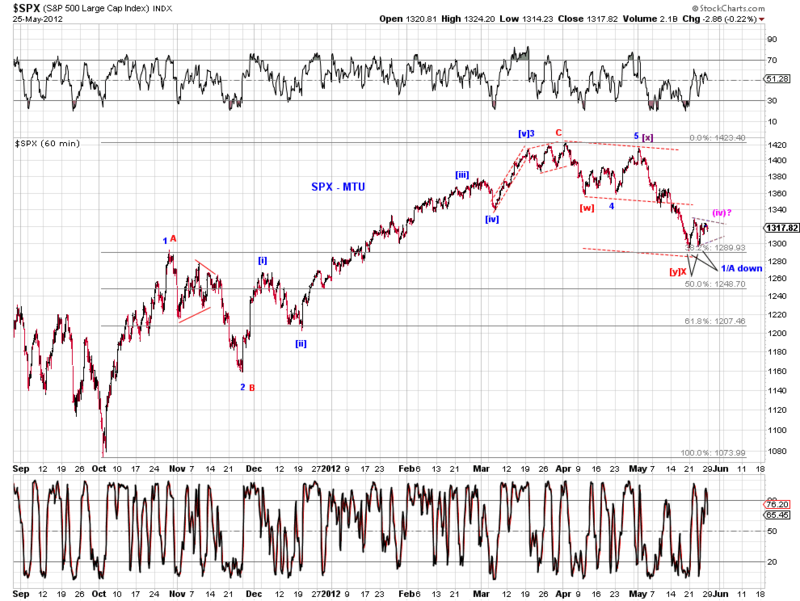 We now have a visual five-wave decline from the recent nominal high. As the squiggle counts in Chart 1 shows, there is not yet confirmation of a trend change in either direction. Chart 2 updates the larger tracking counts. Tracking counts (color coded) update and squiggle counts. See charts. 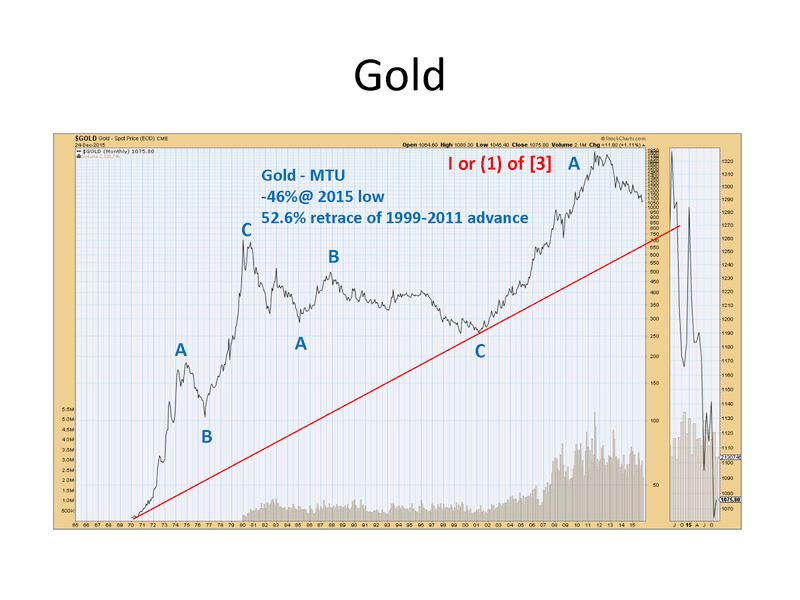 Kissing (chart 1) and potentially wedging if near term high is not in (chart 2). See charts. 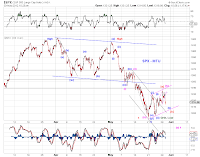 Regarding the big picture, we saw key overlap or near overlap in mid-caps and certain small-cap indexes - see 1030am entry below. 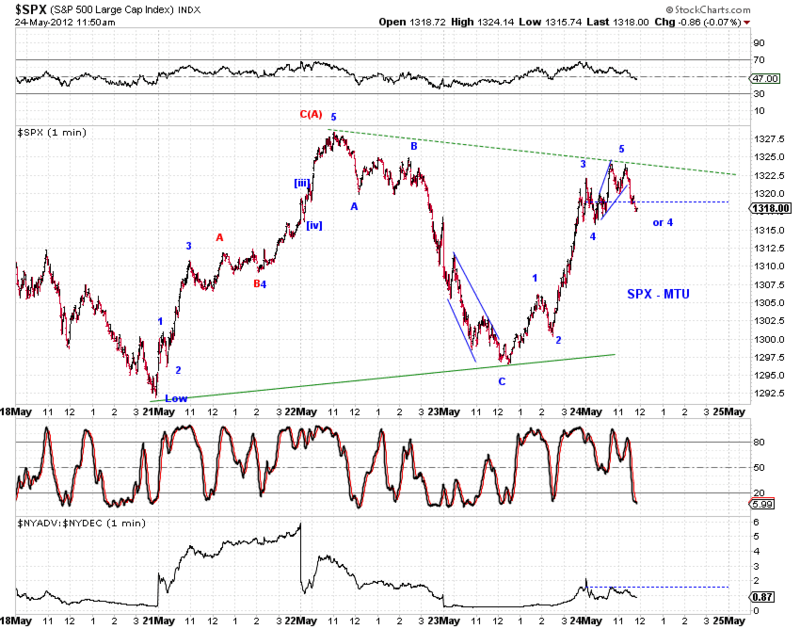 This shifts the odds to a larger rebound (wave2, wave B) or a new bullish advance. However, price actions has yet to prove themselves to be motive. See chart 1 and chart 2. 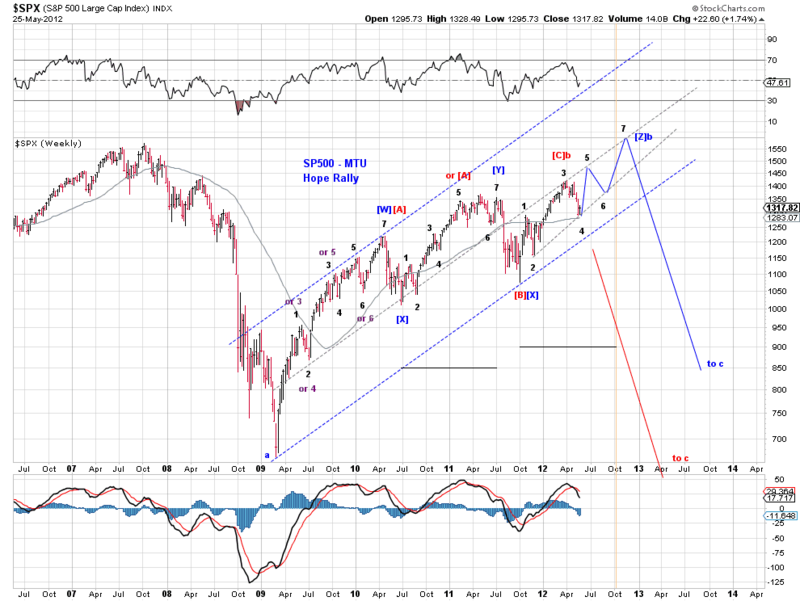 Also see Inside Week (5/25/12) for long term thoughts on the Hope Rally. Top tracking counts - each is color coded. 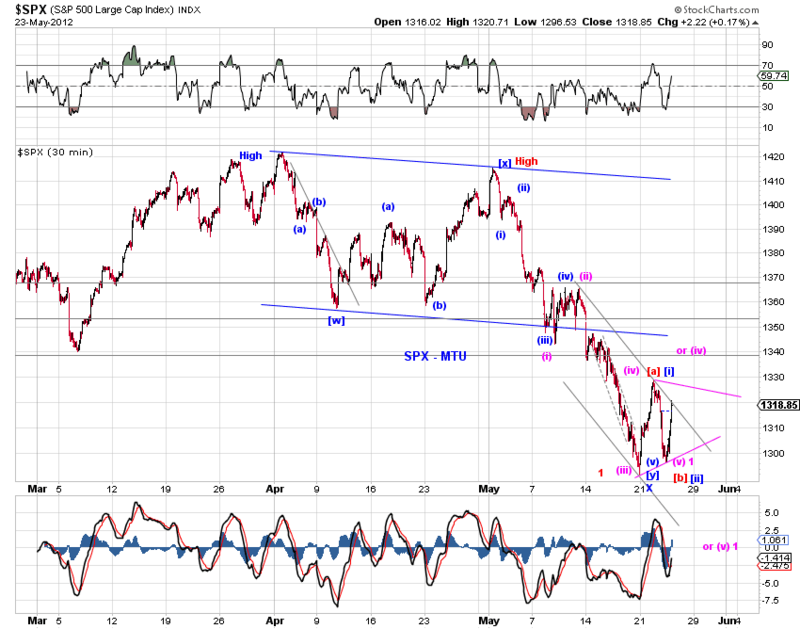 SP400 overlapped with its April low and effectively with its mid May low. 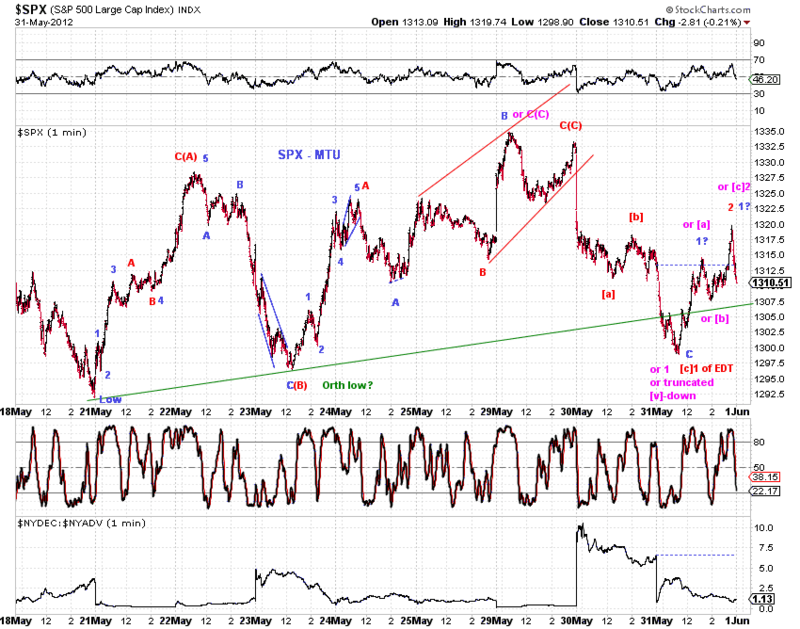 Russell is getting very close to both corresponding lows. 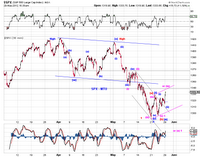 Transports are back inside prior "consolidation" channel. 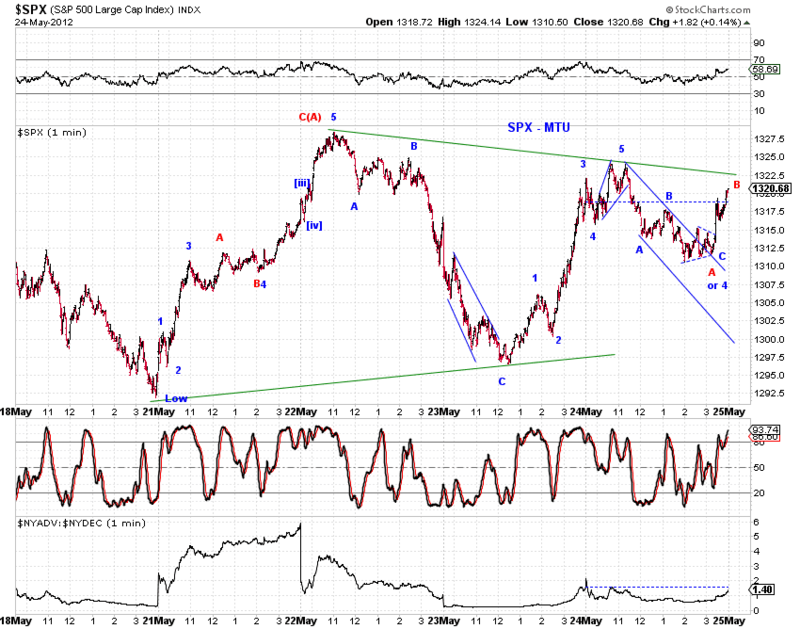 Odds now favor a larger 2nd wave rebound or the next bullish advance. 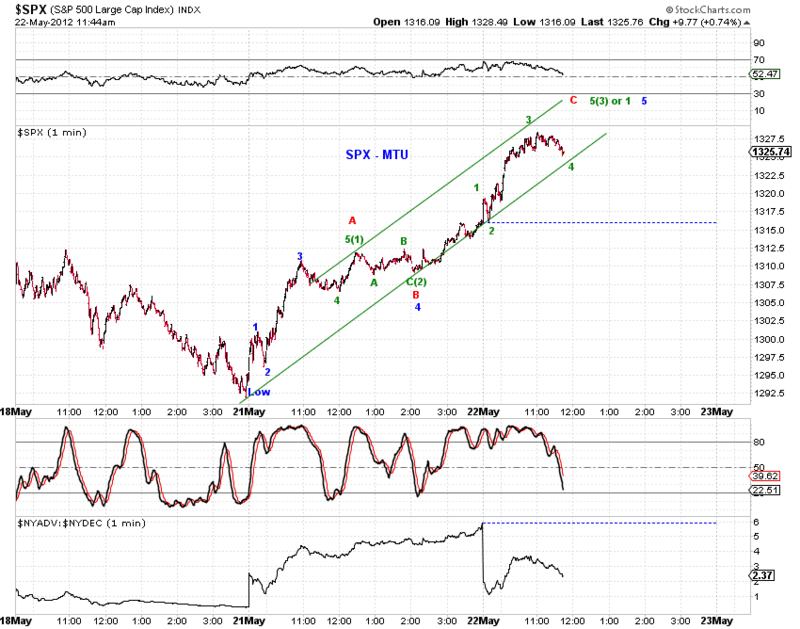 The bearish alternative would be a small b-wave rebound with respect to the May high. ES continues its attempt to regain prior channel support (Chart 1). Let's see if it succeeds. ES price structure eliminates the large triangle consolidation. 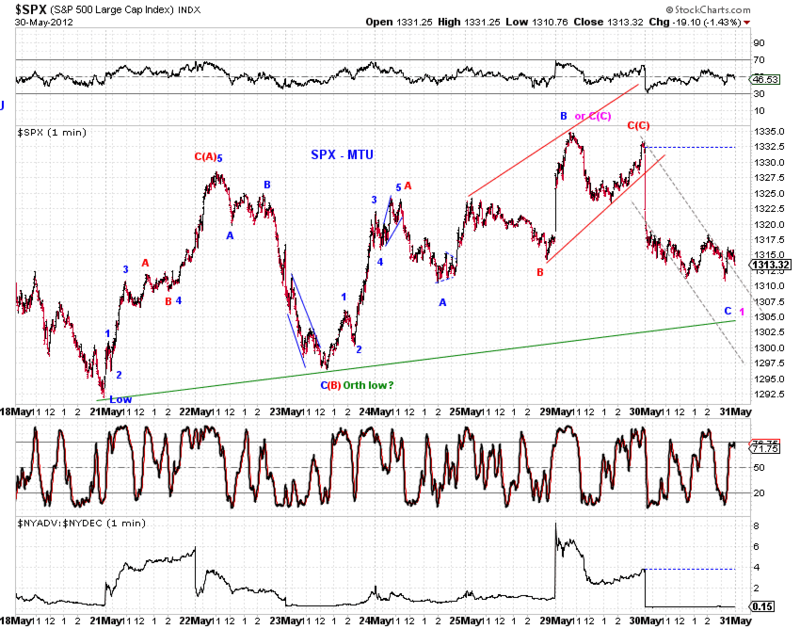 (Chart 2 red) shows a double three rebound bearish squiggle. 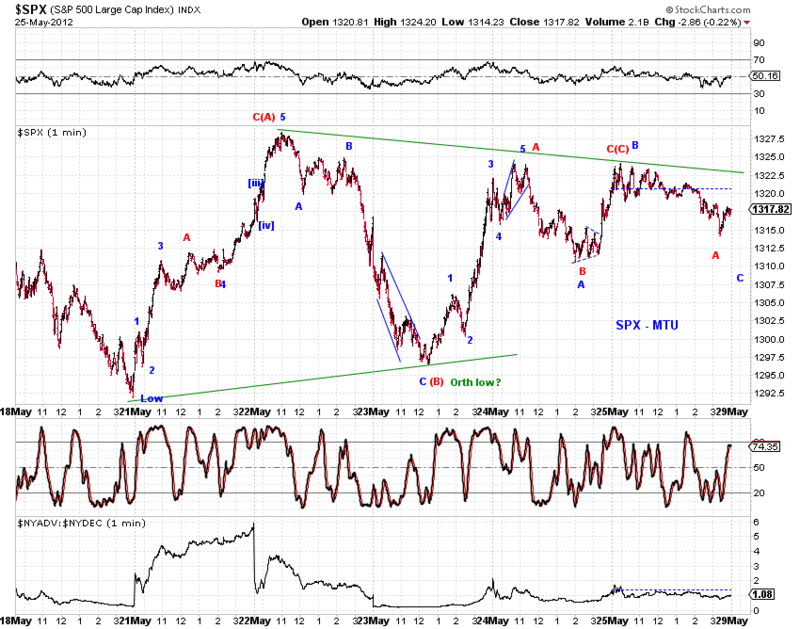 (Chart 2, blue) shows the nested 1/2 bullish squiggle. 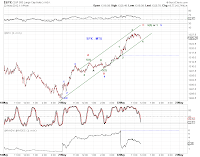 Near term: A larger rebound or a bearish small-degree 4th wave consolidation is likely in progress. Confirmation is still needed. Hope Rally: The prevalence of three-wave structures across many time frames likely suggests further subdivisions higher. Most benchmark U.S. stock indexes had experienced an inside week, with the exception of the Dow which had made a marginal lower low. 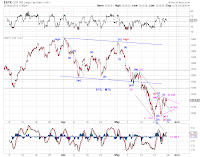 Based on price patterns over the past week, the key question regarding market direction is whether the initial decline from the May high is over (Chart 1, red-bullish, blue-bearish) or a near term bearish small-degree fourth wave (triangle or zigzag) is in progress (Chart 1, pink). 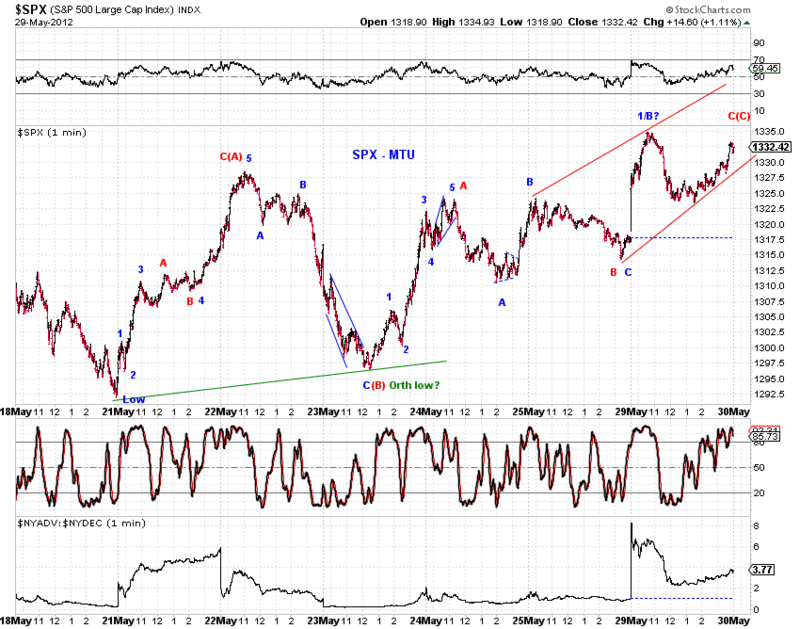 (red-bearish) A potential zigzag or triangle from the nominal low in SPX could be in progress. 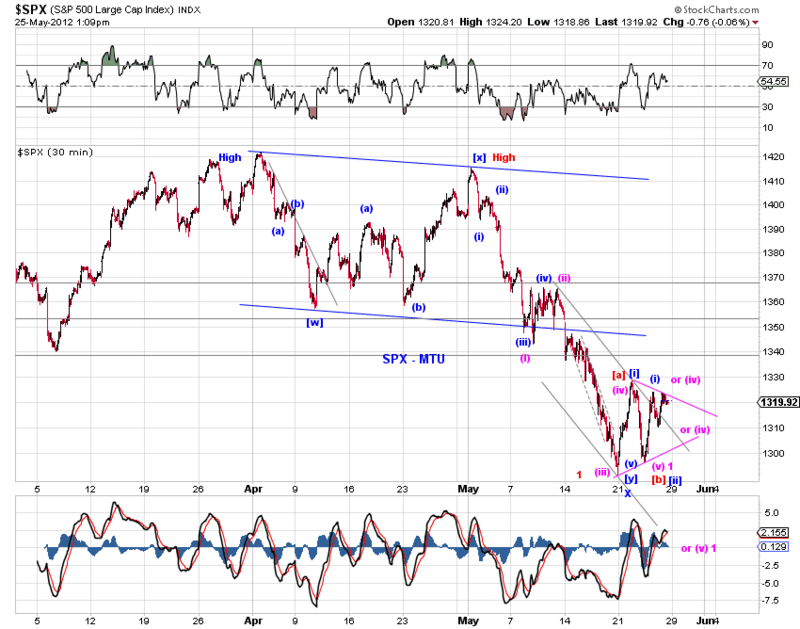 Under this interpretation, we could have a bearish expanded flat or triangle consolidation in the Dow. 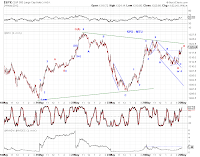 (blue or green - bullish) A series of 1s2s from the nominal low in SPX or an initial rebound from a truncated low in SPX could be in progress. 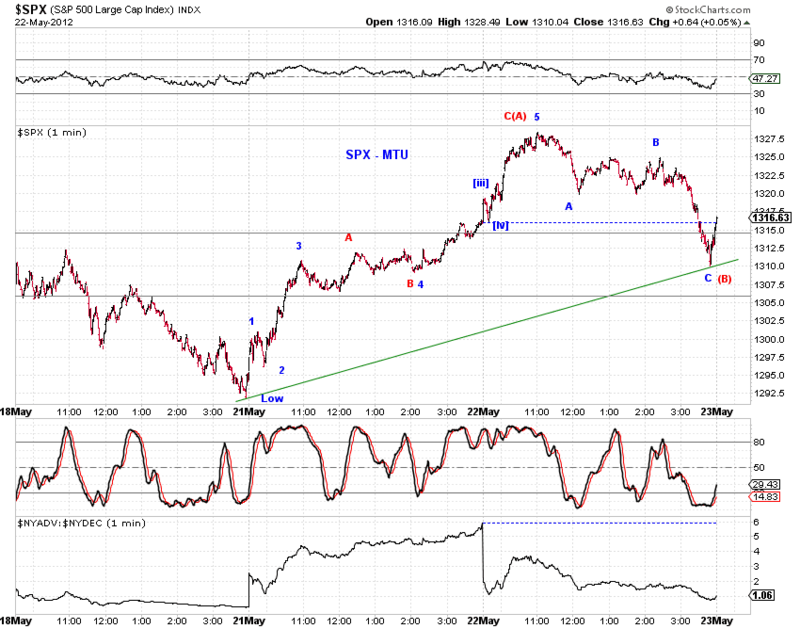 Technical Damage and Support (5/18/12) highlighted potential areas of near term support for the market. 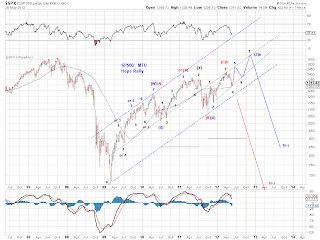 These potential support remains in place in case a small-degree fifth wave decline does materialize. 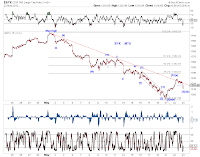 The prevalence of three-wave structures across many time frames invites us to take another look at the larger picture - the Hope Rally since the 2009 low. 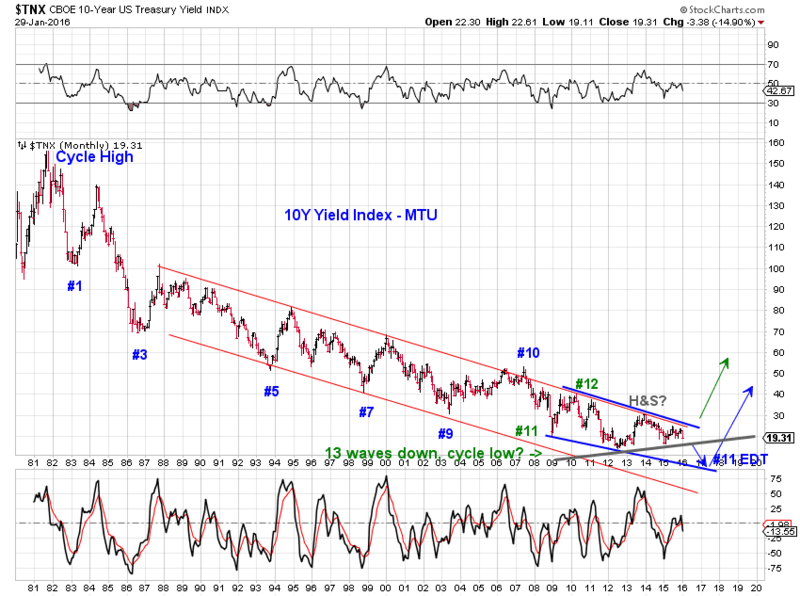 Chart 3 presents key observations. The Hope Rally has likely been progressing in a triple-three structure according to the blue count. 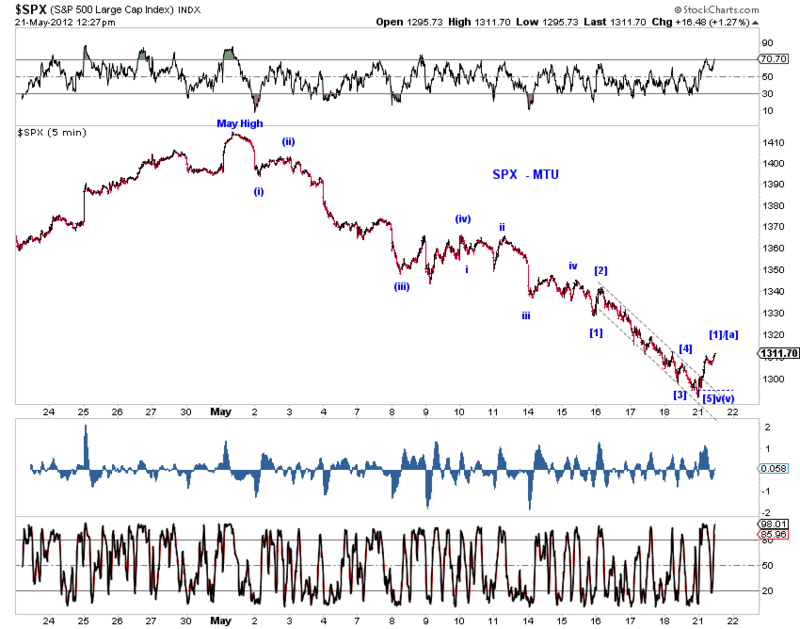 Wave [W] and [Y] count well as a 7-wave double-three structure (see the black labels) while the two [X] waves count well as a simple three wave structure. would end, whether shortly before or after the U.S. election. The golden vertical line indicates where wave [Z] and wave [Y] reach equality in time. 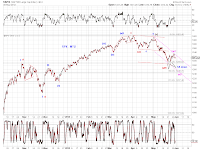 It's possible/probable that the Hope Rally has already ended at the May high (see the red count), around the not-so-uncommon mid-channel line. However, there's no confirmation yet and odds appear to favor further subdivision higher based on certain wave structures, near term technical support and policy expectations. Tracking counts refreshed. 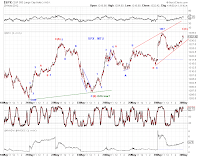 Subjectively speaking, bullish counts appear more probable. 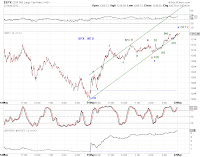 The PM pullback is likely a small degree 2nd wave or 4th wave, or a small degree b-wave to a lesser extent. Chart 1 refreshes the larger tracking counts and Chart 2 offers a squiggle count. 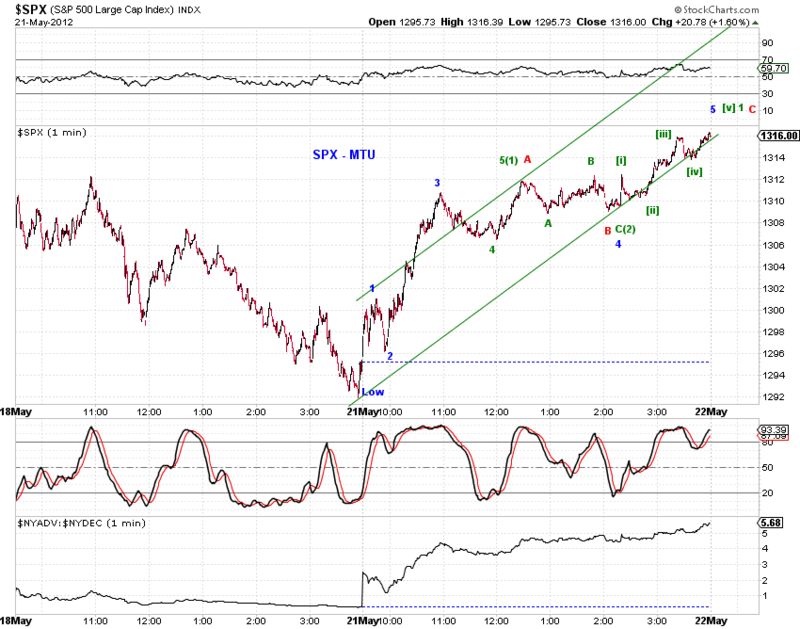 As the 7am entry points out, SPX/ES is trying to regain trend channel support. There's no resolution yet at the moment. Overall, relatively clean wave structures. See charts. 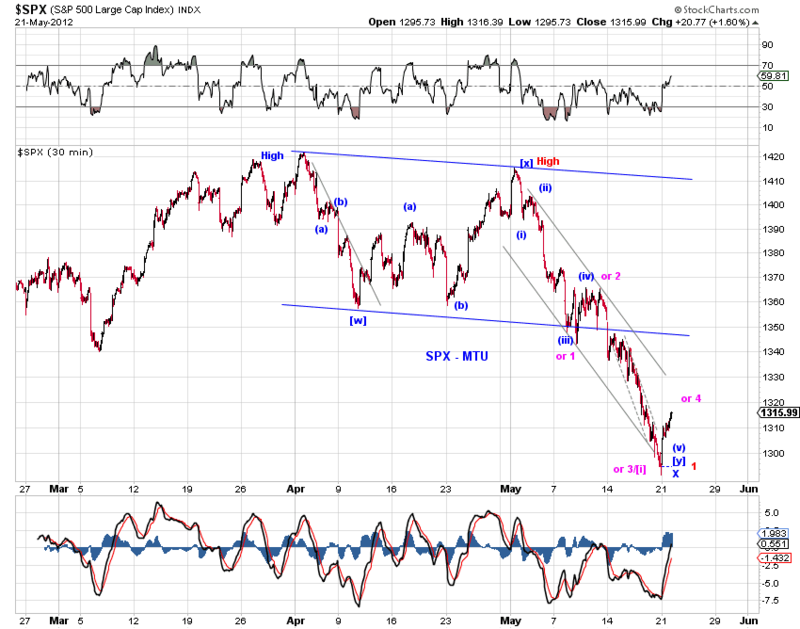 Big picture wise, ES is attempt to kiss the trend channel resistance and regain the support (Chart 1). Overnight, ES found support after testing the prior down trend line (Chart 2). Chart 1 updates our tracking counts. It's possible that today's low (with a lower low in the DOW) is a truncated 5th wave according to the pink count, but the prior lows have held in most indexes as well as in ES (Chart 2). 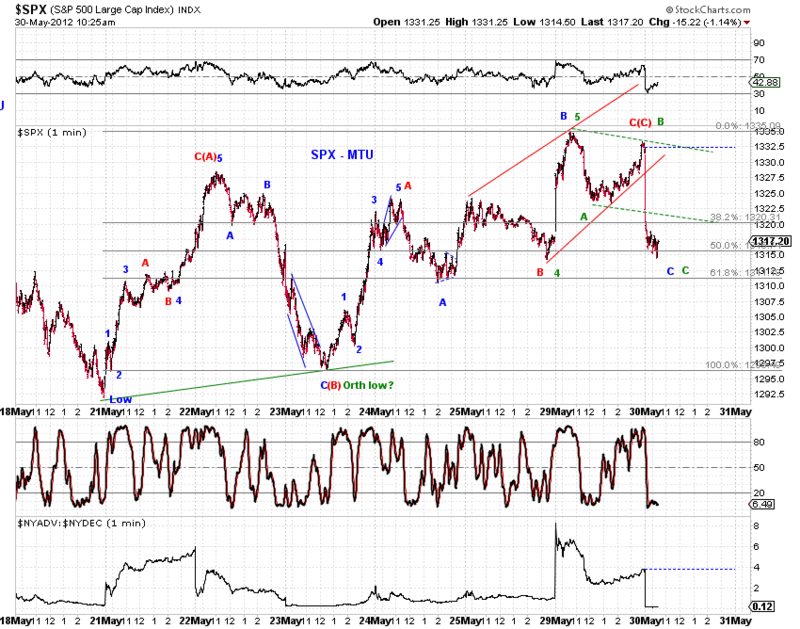 For the moment, let's call today's low a small degree wave 2/B retrace (Chart 1, blue or red). 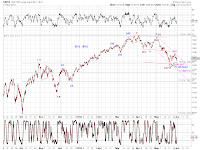 On the squiggle level, the market is retracing a better-formed five-up in ES and a fuzzy five-up in cash SPX (Chart 1 and Chart 2). Chart 3 and Chart 4 show the larger counts discussed in days. 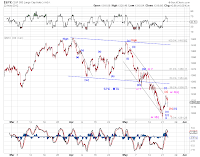 ES turned down overnight at down trendline resistance and found support at the potential base channel. 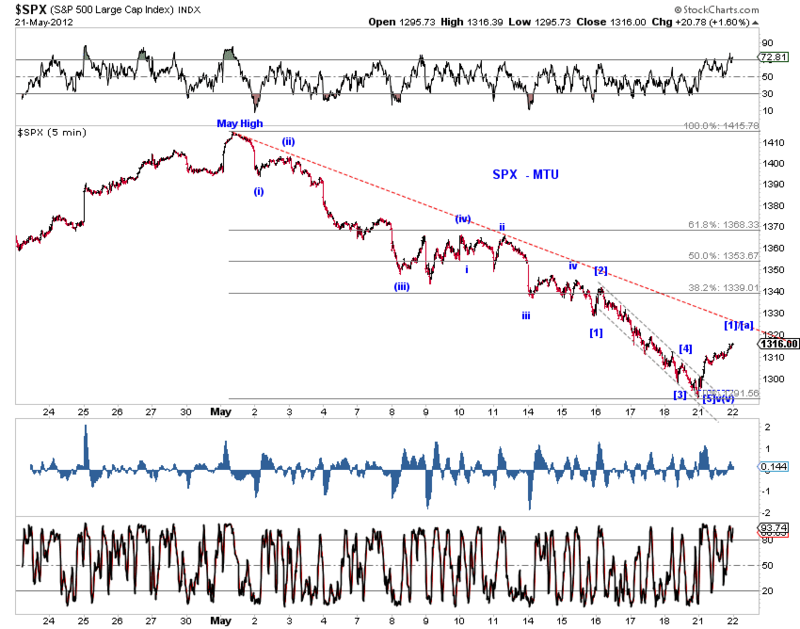 A five-wave decline from the May 1st high in U.S. stocks is likely over (Chart 1). 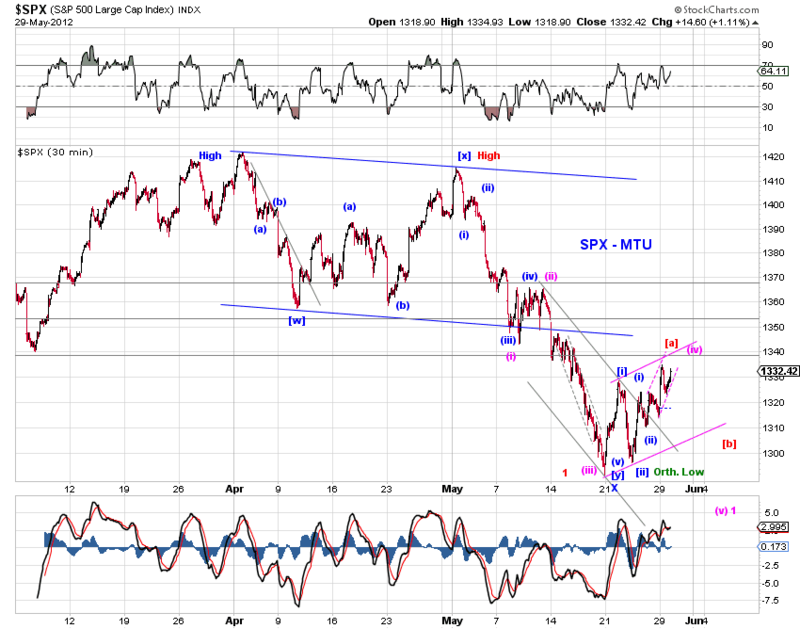 The minimum target for the upswing is around 1340 in SPX if this interpretation is correct. 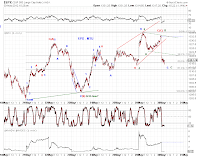 On the bullish side, there's significant upside potential if the recent low marked the end of a flat correction (Chart 2, blue). 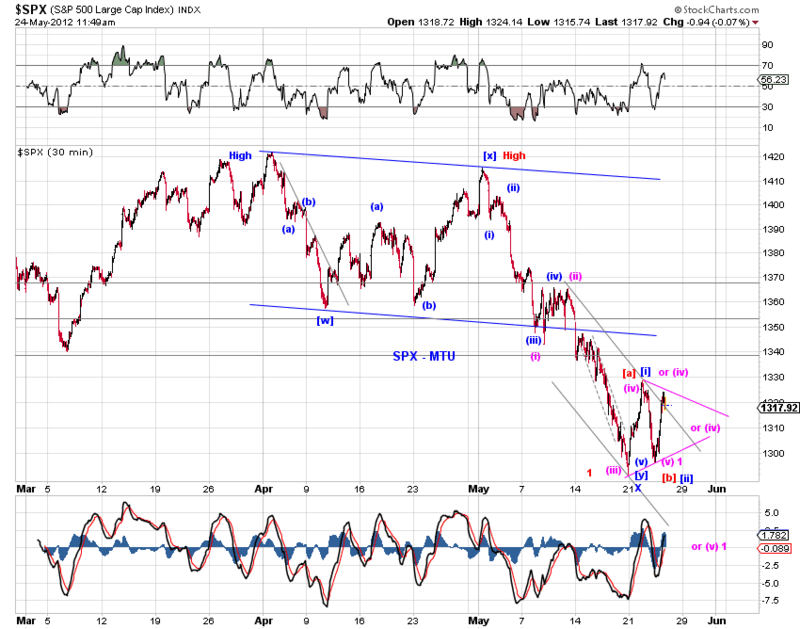 On the bearish side, today's rebound could be a small degree wave 4 (Chart 2, pink). Also see Technical Damage and Support (5/18/12) for further discussion. 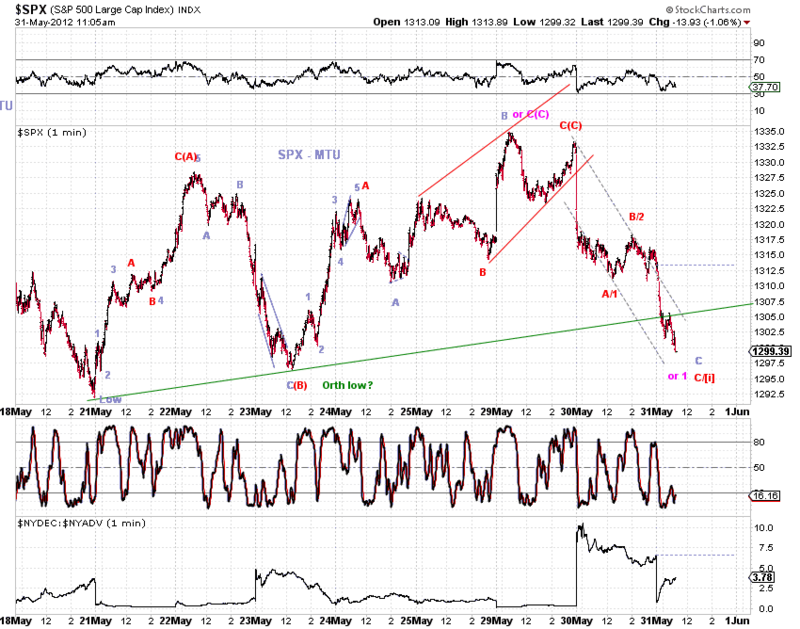 Wave structures off the recent low (Chart 3) match well with key tracking counts mentioned above. 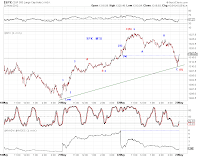 The green and red counts in Chart 3 are primary bullish and bearish tracking counts on the squiggles, respectively. 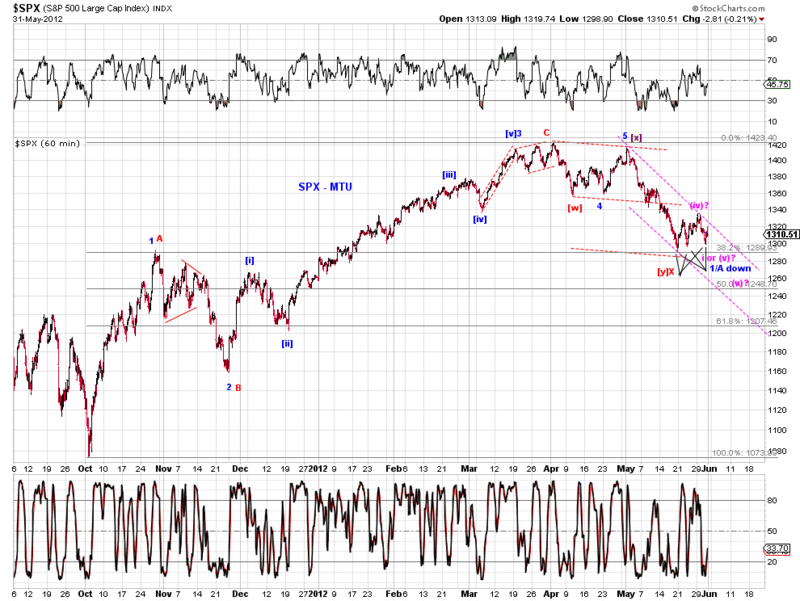 A visual five wave advance off the recent low at the moment. Potential to extend the impulse or morph into threes. See charts.